Writers in this issue of the journal have a lot to say about the role that the law and regulatory bodies can and do play in supporting ethics at various levels. 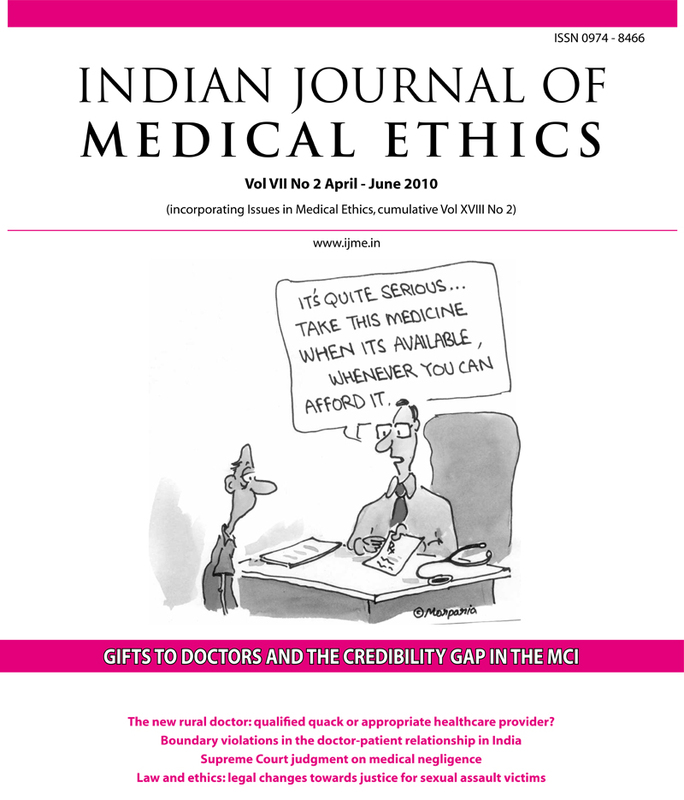 An editorial speculates on whether the Medical Council of India’s ban on doctors receiving gifts from the drug industry has any meaning given the poor credibility of this institution. Another editorial asks whether the MCI’s rural doctors scheme will result in more equitable access to healthcare. A senior jurist comments on the recent Supreme Court judgment on criminal medical negligence and its implications for medical practice. An activist comments on the legal battle launched by Bayer to block generic drug production, and the implications for people’s right to affordable medicines. An article discusses laws relevant to decisions on patenting of human genetic material. A survey of boundary violations in the doctor-patient relationship found enough evidence that sexual and nonsexual boundary violations occur in India, and this is a matter that needs urgent attention. Professional bodies need to implement existing guidelines on this subject. With this issue we start a regular column, Ethics and the Law. In the first column, a forensic doctor presents an overview of laws applicable to sexual assault cases and amendments in these laws as they relate to the responsibilities of healthcare providers. We welcome submissions to this column. The new rural doctor: qualified quack or appropriate healthcare provider? How does a nation decide what healthcare to pay for?